The homemade pizza we make is delicious, but different than the standard pizzeria type. The crust is usually a little fluffier and the sauce is thicker and chunkier. Today’s pizza, however, has a thin crust and light sprinkling of cheese that is similar to take-out. Of course, since it is homemade, it is significantly better! 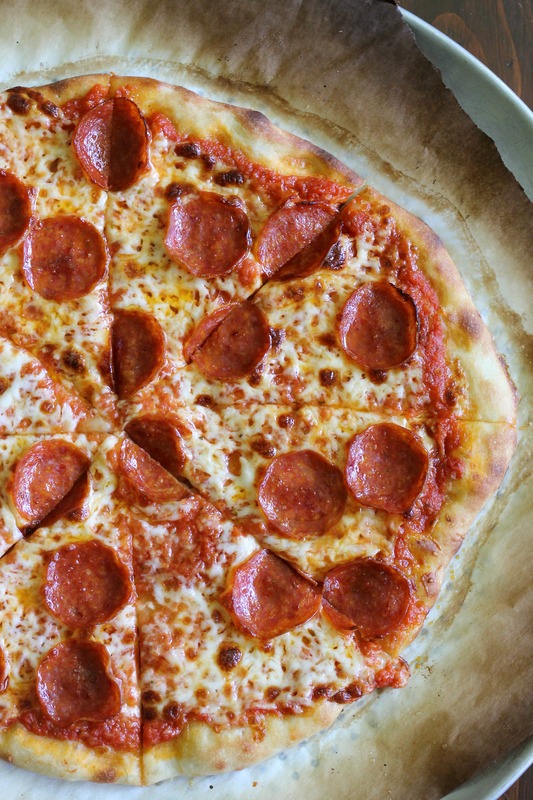 This pizza is quite simple to make (the sauce does not involve cooking) and the dough is not difficult either (it’s made in the food processor! ), although it does involve a 24+ hour rise. This is a very good starter pizza for those who have not made homemade pizza before since it is almost too easy to make. The dough isn’t overly sticky, so beginners (and anyone) will have no trouble getting their pizza to be circular! The thin, crunchy crust is flavorful and the sauce is actually our favorite pizza sauce recipe that we have come across. Do not be fooled by the pepperoni in this picture- neither of us like pepperoni that much, but unfortunately, the plain pizza got eaten before we could take a picture! I guess the rest of our family likes plain pizza better as well! In a food processor, combine the flour, sugar, and yeast for a couple seconds to mix. While the machine runs, slowly pour in the water. Process for about 10 seconds, or until dough is combined. Let dough rest in the food processor for 10 minutes. Add in the oil and salt and process the dough for 30-60 seconds, or until a satiny ball forms. Knead the dough for about 1 minute on a lightly oiled surface. Place the dough in a large oiled bowl and cover well with plastic wrap. Refrigerate for 24 hours to 3 days. Process all the ingredients together in the food processor until it reaches your desired level of smoothness. Refrigerate until ready to use. One hour before you start to bake the pizza, put the oven rack to the second-highest position. Set a pizza stone on the rack and heat the oven to 500 degrees. Remove the dough from the fridge and halve it. Shape each half into a smooth ball. Place the dough balls on a lightly oiled baking sheet 3 inches apart. Cover them loosely with a piece of plastic wrap that has been sprayed with non-stick cooking spray. Set aside for 1 hour. Coat one ball of dough with flour and place on a well-floured surface. Using your fingertips, gently flatten the dough into an 8-inch disk, leaving an inch crust around the edge. Gently stretch into a 12-inch round, working along the edges and giving the dough quarter turns as you stretch it. Transfer the dough to a piece of parchment (or a floured pizza peel) and stretch it into a 13-inch round. Spread about ½ cup of the tomato sauce over the dough, then sprinkle with half of the Parmesan cheese and half of the mozzarella cheese. Top with any toppings you might choose (mushrooms, peppers, pepperoni, sausage, etc.). Slide the pizza and the parchment gently onto the baking stone and bake for 10-12 minutes, or until the crust is brown and crisp and the cheese is bubbly and melted. Remove the pizza and let cool on a wire rack for about 5 minutes. Slice and serve. Repeat these steps with the second pizza. Enjoy!